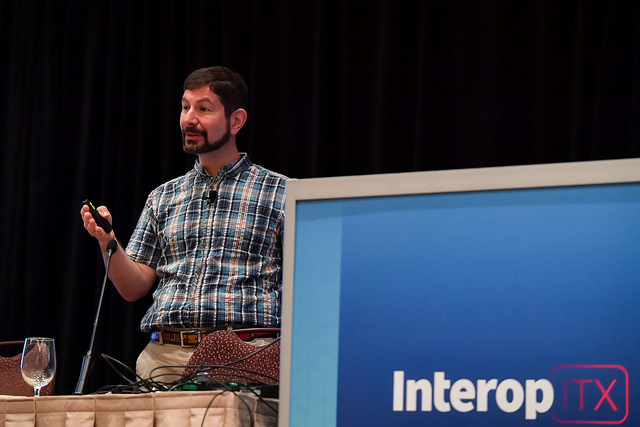 Interop ITX speaker Rob Hirschfeld provides a reality check on a hot trend that promises to make data center infrastructure more efficient. "I'm pretty skeptical about composable infrastructure," he said, prefacing his talk. "I'm not a fan of bright and shiny for bright and shiny's sake. It needs to solve a problem." Hirschfeld noted that while his focus is software, what his company does -- develop software to automate bare metal servers -- has a lot in common with composable hardware. Composable infrastructure is "about how you change your hardware's form factor," he said. From his perspective, the important criteria when buying IT infrastructure are: commodity components are interchangeable, it's manageable at scale, and it reduces implementation complexity. "If you're not reducing the complexity of your environment, then you're ultimately creating technical debt or other problems," he said. "So it's very much like a virtual machine, but with bare metal," he added. Today's composable infrastructure solutions use high-speed interconnections -- PCIe and NVMe -- to extend the bus length of the components in a single computer, he said. The CPU remains the central identity of a system, but resources like RAM can be reassigned. Hirschfeld noted his distaste for the term "composable," which can be confusing taken out of context. Moreover, composable infrastructure can be confused with converged infrastructure, which he described as creating infrastructure using common building blocks instead of having specialized compute/storage units. While converged infrastructure is often used to simplify implementation of virtualized infrastructure, practically speaking, composable infrastructure competes with virtualized infrastructure, he said. Composable infrastructure is designed to enable the creation of "heterogeneous machine configurations without knowing in advance your target configuration needs," according to Hirschfeld, who added that virtualized infrastructure can accomplish the same thing. While composable infrastructure is cool technology, IT buyers need to consider it from a practical point of view, Hirschfeld said. "My concern with this model is that I have 10 chasses of composable infrastructure and each has 20% spare capacity. Now I have to figure out how to manage that," Hirschfeld said. Most people he knows don't dynamically scale their capacity, which is why he's a skeptic, he said. "I'm not saying don't buy this hardware. There are legitimate vendors and it might solve your use case," he said. "But understand what your use cases are and pressure test against other solutions on the market because this is a premium model." Hirschfeld isn't sold on the benefits composable infrastructure vendors promise, such as reduced overprovisioning, improved time to service, and availability. "In both cases, you'll have a pretty predictable use of infrastructure," Hirschfeld said. "If you don't, you're probably not buying infrastructure, but buying it from a cloud provider."